Set to join the fleet in 2020 are two new ships, which will be known as the “Allura Class”. The two new ships will be the same size as the Marina and Riviera, however, they will hold fewer passengers. Oceania Cruises have revealed that they will be spending $100 million on renovating four of their current 684-passenger ships which they are branding as Oceania NEXT. The ships that will be refurbished include Regatta, Insignia, Sirena and Nautica. The refits will consist of a complete transformation of the ship's interior appearance. There will be 342 new designer suites and staterooms, along with new, fresh décor in a variety of venues onboard such as the restaurants, lounges and bars. This transformation process will first apply to Insignia which will debut the new look on 7th December 2018. Following this will be Sirena in May 2019, Regatta in September 2019 and the final ship to be refurbished will be Nautica in June 2020. The four ships will undergo an extensive refurbishment that will focus on introducing brand new interior design by adding in elegant furnishings from Baker and Donghia, accompanied with fabrics from Rubelli and Kravet. The Grand Staircase will be further enhanced with the addition of new intricate railings, balustrades and a stunning glass chandelier that adds even more grandeur to this area. As mentioned, the restaurants will also be transformed. The Grand Dining Room will adopt a completely new appearance with the addition of new cream leather dining chairs that are outlined with a metallic bronze. The previous chandelier will be replaced with a breathtaking crystal chandelier which will act as the main centrepiece of the dining room. The popular bar, Martinis, will receive a new colour palette by taking inspiration from the beautiful Santorini with deep Grecian blue, sienna and chocolate browns and stately pewter. The trademark walnut panelling will accent the bar along with silver-white marble and tobacco quartz. The staterooms and suites onboard the four ships will be modernized and re-inspired. They will become more spacious and lighter thanks to a new colour design. They will feature furnishings that are custom-crafted and exotic stone and polished wood finishes. The staterooms and suites will offer the ultimate celebration of style and comfort. The bathrooms will consist of new designer fixtures, chic glass shower enclosures, and sumptuous vanities. The bathrooms for the Penthouse, Vista and Owner's Suites will boast more space and they will have a Carrara marble, polished granite, and sleek onyx appearance. A great addition to the staterooms and suites will be USB ports that guests can use. There will also be a state-of-the-art television system offering a wide range of movies as well as itinerary information and weather updates. Five star luxury on the ocean, Oceania Cruises offer the world's only upper premium cruise line. With the debut of the newest member of the fleet, the breathtaking Sirena, Oceania Cruises explores more of the world than ever before. The Mediterranean will delight you with ancient monuments and modern marvels, while the Baltic and Scandinavia reveal the pathways and palaces of kings, czars and Vikings. The vibrant colours of autumn in New England and Canada are just as enchanting as the glistening silver and blue of pristine glaciers of Alaska. From the chic delights of Paris to the gilded splendours of St. Petersburg to the scenic landscapes of the Pacific Northwest, everything you ever imagined and more awaits you. 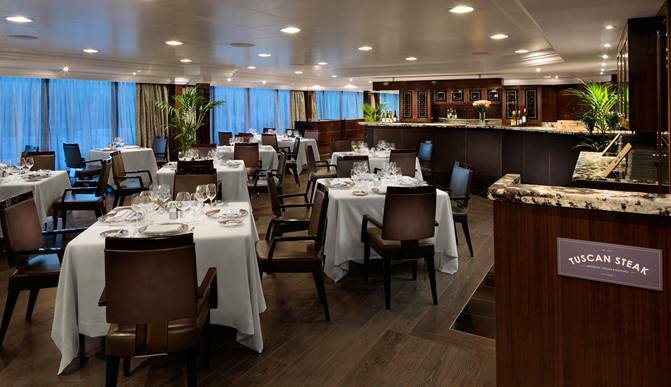 Oceania Cruises do pride themselves with the finest cuisine at sea. The culinary artistry of the legendary Master Chef Jacques Pepin is responsible for the exquisite cuisine onboard each of their ships. Chef Pepin inspires the culinary team to perform feats of gastronomic wizardry. Memorable dining begins with open seating, as it allows guests to dine when they choose and with whomever they want. Regardless of which one of the restaurants you opt for, there are no additional dining charges. Each one of the Oceania ships boast a personalized service with an impressive staff-to-guest ratio. Being of service comes naturally, a trait as innate as their unbridled enthusiasm. Their commitment runs deep and never diminishes, no matter what the task. Welcome to a world of elegance without pretence... so refreshing and comfortable that it's like being in a private country club where everyone knows your name. - Extraordinary high staff-to-guest ratio (1 to 1.6) ensures the finest personal service. 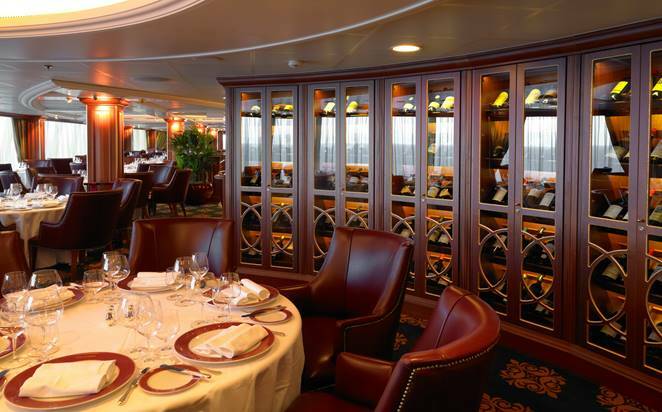 - Dining room and galley staff chosen from internationally acclaimed restaurants. - Butlers formally trained by members of the Guild of Professional English Butlers. - Dedicated concierges attend to your every request. - Suite and stateroom attendants carefully selected from the world's finest 5-star hotels. - Staffed Executive and Concierge Lounges offer complimentary beverages, pastries and snacks throughout the day and evening. Travel the world in unequalled comfort and experience the best in personal customer service with two members of staff for every three guests. They pride themselves on remembering your name, preferences and treat you as the individual you are. Get cooking on the custom-designed, hands-on cooking school. Featured amongst many other activities and services on board including Master Chefs which offer inspiration and guidance, but you do all the cooking yourself! Every recipe is unique because the instructors buy all the ingredients fresh at the market. Oceania offers a variety of the “must-see” places and the lesser known ports. We even offer overnight stays at some ports to really drink in the culture and nightlife. There is a wealth and assortment of locations to explore and wonderful ways to discover them. Glide across the coral reefs of Tahiti in a glass-bottom boat, hunt for black pearls in Bora Bora, ascend Sugarloaf Mountain in a cable car, venture out on an African Safari or savour the wondrous displays of nature in Alaska. Your world, your way.